Smart speed indicator device of motor vehicles. 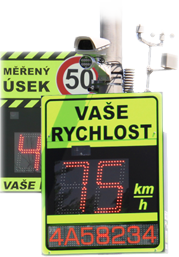 The device displays the driver his speed immediately or informs others about the speed of the driving vehicles in the distance of 80m before radar. The main element is a microwave transmitter (radar) and receiver integrated in the box along with the electronics and number display, made of high luminous red LED diodes for displaying speed values. It is used especially in places with lowered or restricted speed or in places with high occurrence of traffic accidents. 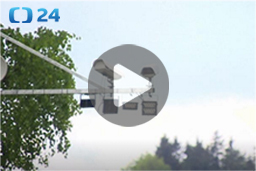 Increases security in places with high concentration of pedestrians, for example pedestrian crossings in front of kindergartens, schools and hospitals..